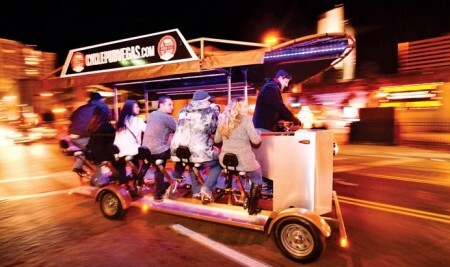 Adding an element of whimsy to downtown pub crawls, Cycle Pub Vegas takes parties to the city’s top bars on a group-peddled bike. Facing each other across two bars, groups power their movement through the peddles at their feet as a trained driver captains them to a custom itinerary of bars, each offering their own drink and food specials. An onboard sound system allows riders to pump their own tunes or create eerie zones of silence with the opposite waveform of a noisy crowd. Peddlers are welcome to tote along snacks and non-alcoholic beverages to keep bodies fueled while powered their nightly transport.